Studio A – Our 400 sq. ft. control room features 11’ ceilings and provides a comfortable listening environment with balanced, accurate sound reproduction. We have a great combination of vintage and modern gear built around a Neotek Elite mixing console, 650pt bantam patchbay, and ProTools HD (32 I/O). Monitoring by Barefoot Sound, Yamaha and Avantone. Studio A sports a diverse selection of microphone preamps and a comprehensive collection of outboard gear to cover any situation. Recording platforms include ProTools (HD), 2’ Tape (Ampex Mm1200) and Radar24. The control room is surrounded by a spacious live room and three isolation booths, ready for very complex sessions. The 1020 sq. ft. live room has 12’ ceilings for a wonderfully open yet controlled sound, and is perfect for both music and video recording. The room is large enough to function as a staging area for video productions, which have much to benefit from the sonic control and isolation of the room against the usual environmental variables existing in other un-dedicated spaces. A large curtain and a healthy supply of sound baffles allow the room to be controlled to taste. The live room hosts a 1950’s-era 7-foot Heintzmann Grand, a Hammond L100 and a Hammond X5 organ with a 147 Leslie cabinet, an upright Heintzmann Piano, Fender Rhodes, and a diverse selection of keyboards, amps, guitars, drums, and percussion options. Private Ear has a comprehensive collection of microphones, including Neumann, Geffel, Coles, Beyer, Shure, AKG, Audio Technica, Rode, Vertical, AEA, Sennheiser, Fostex, and Oktava. Three isolation rooms (140 sq. ft., 60 sq. ft., and 50 sq. ft. respectively) are equipped for recording additional instruments and vocals in isolation. The largest isolation room can accommodate enough inputs for a multi-mic’d drumkit or percussion setup. Patch is as follows: Live Room - 24ch, Isolation 1 - 10ch, Isolation 2 - 6ch, and Isolation 3 - 3 ch. 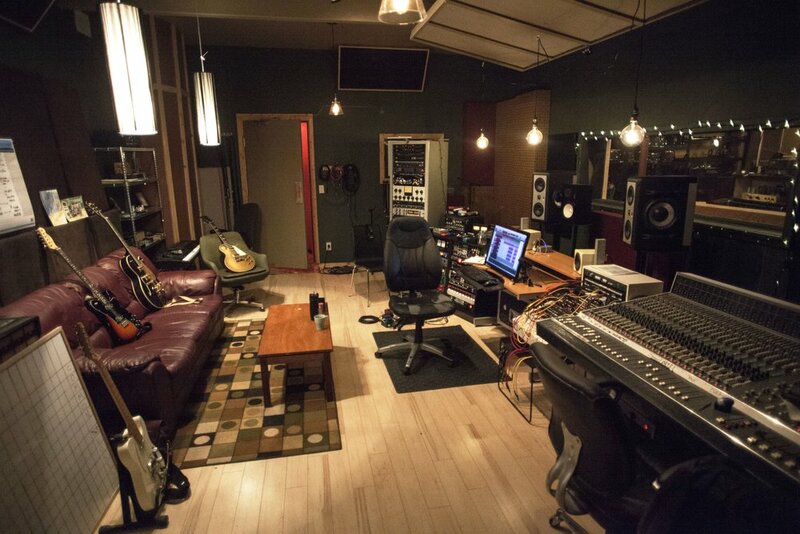 Studio A is a great space for those who wish to bring in their own engineer/producer for recording projects. You can bring your gear or use ours. The space also allows for those artists/bands who want to film their sessions the space to do so.